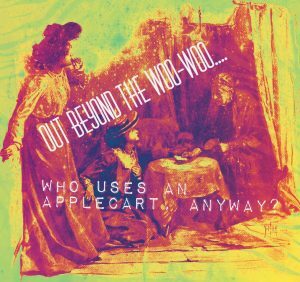 Out in the Great Beyond Woo Woo: Having Fun with Factual because who pushes applecarts anymore, anyway? What does it mean to be “woo woo”? I learned today from google that “woo woo” is a cocktail that sounds pretty darned yummy and what I was looking for was a classification of people or the way some people experience… again caught in a web of words. It is almost a pejorative when someone says “woo woo”. 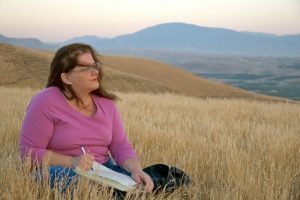 When I say it, I am often describing myself, the mystical me – the one who believes in a sort of alternate way at times that people who are more linear or scientific or stodgy might not understand. They might say I am cooky or nuts or… out there. See, words can be tricky. This is how it relates back to the Untalkaboutables. When we dance around or use metaphor or refuse to face what is so – we cloak that topic in being wrong and our mind hears “wrong” and this can be, at least, frustrating to those of us who thrive on accuracy and damaging to those of us whom “people pleasing” flows through our veins whispering “don’t do it wrong, don’t upset the apple cart”. 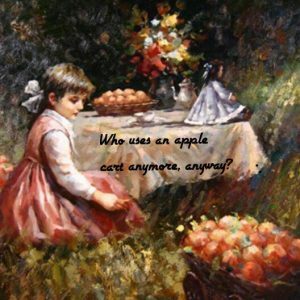 Who even pushes an apple cart anymore? Who even uses an apple cart anymore? 1. Practice being as factual in your conversation as possible. 3. Do the opposite: be as ridiculously, flagrantly un-factual as possible in your conversation. This is actually a lot of fun and quickly brings us back to the facts. And as always, we may start this practice with our writing. Take the three steps above from conversation and write them, instead. I would love to hear from you about your progress with talking about your “Untalkaboutables”. Please comment your thoughts, experiences with woo woo and/or applecarts and maybe you would benefit from watching more on my YouTube channel, too. This particular video is about the twisting, curvy road of transformation. Take a moment to watch this video and then subscribe over there as well. You know those beliefs that are stuck so deep you don’t speak them ever for fear of… well, for me I suppose it is fear of amplifying that belief no matter how false I pray it is. Wrong. The reality is, if I don’t say it aloud it gains more and more power over me. This morning I took on one of my primary, most primal fears that perhaps you share with me. After all, the majority of us have this fear hardwired into us. I replaced that belief with the simple affirmation. Love is everywhere. Love is everywhere. Love is everywhere. 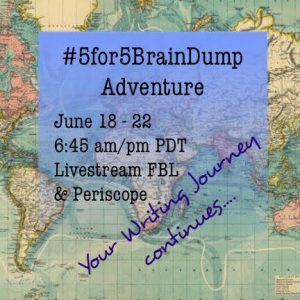 Using the 5 minutes of magic that is #5for5BrainDump…. well, read further to see what came next. I am so uncomfortable approaching this topic, I am going to use the phrase above repeatedly in my writing so if I veer off course with it (avoidance) I will plug it back in. Here’s the thing: it isn’t true but for the majority of my life I have been acting as if is true and I have had enough of it. I know that you and I both have a purpose and a mission to fulfill and mine is anything BUT being afraid of being abandoned because I have learned… I won’t be… because over the years people I thought I could trust HAVE abandoned me yet I was never alone. My mind is flashing back to a Davy and Goliath episode from long past, perhaps my favorite one because Davy was on a train and it was like the train was speaking to him, “God is everywhere, God is everywhere” and if the God word bothers you, plug in whatever you believe in instead.. perhaps “Love is everywhere, love is everywhere, love is everywhere” and in fact, beloveds, I might scoop up that mantra and carry it with me from now on. Because I know above all, People will not reject me. I thrive when I recognize I am living according to the purpose I was born to fulfill. How invigorating this is for me and for you, too, because I believe we all have a purpose, a mission, a reason…. Perhaps part of mine is to tell you that talking about whatever it is you think is too scary to speak will take you along a path of extraordinary freedom. Who thought when I started with “People will reject me: I don’t want to/I can’t survive being abandoned” that I would end with freedom? 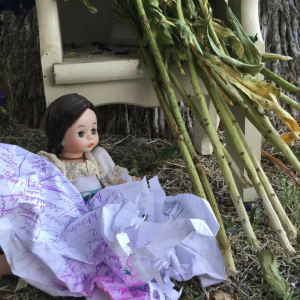 My norm is to scoot off course when I write something that scares me but today was different. Maybe it is because I was holding my purpose in my heart and I was holding YOU in my words as they flowed from me. The timer went off when I put the question mark on freedom. Affirmative, right? Yes. 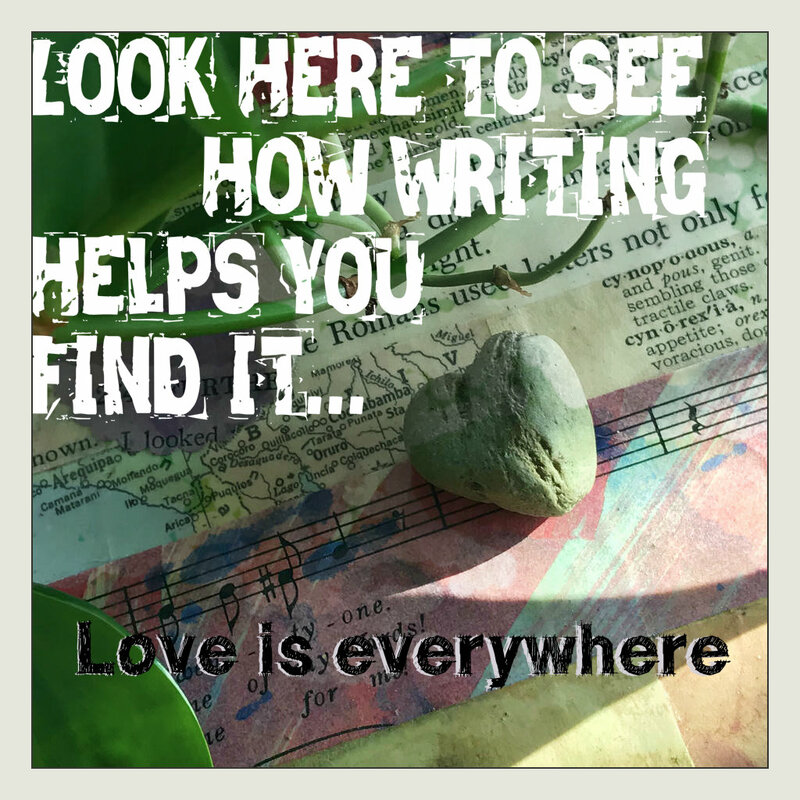 Because Love is Everywhere. I may open my heart and trust divine timing. That feels so good. That feels so good…. 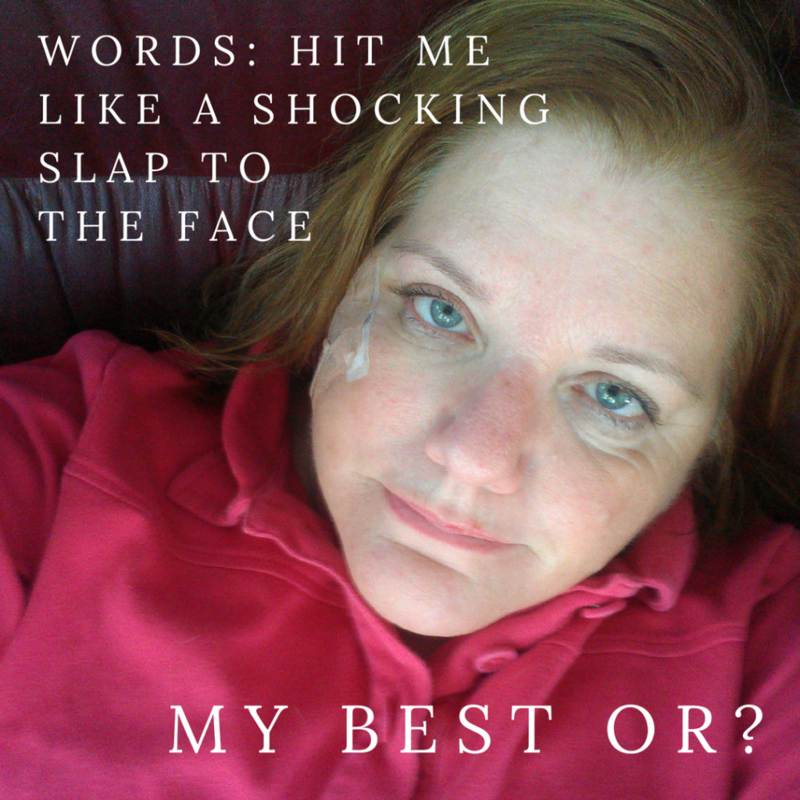 Tell about a time when you didn’t speak (or write, or journal or even think) about a particular sore subject. Remember what I’ve said here – and take a step toward giving freedom to that untalkaboutable so that you may shine in your unique, distinctive purpose. Start with a sentence, just a sentence, and see if you are able to write for five minutes. I’m available if you need me. Call or text me at 661.444.2735. I’ll take it one step further and invite you to our next #5for5BrainDump which I offer for as a gift from my heart to your pencil, pen or fingers on the keyboard to let those words flow now, to end any lingering writer’s block, and discover the miracles that rest within you, waiting to step through the door marked writing freedom. The world is waiting for your words. Let’s get them on the page, together.